Mechanical forces (e.g. tensile or compressive forces) will usually have little if any effect on the overall corrosion of metals. 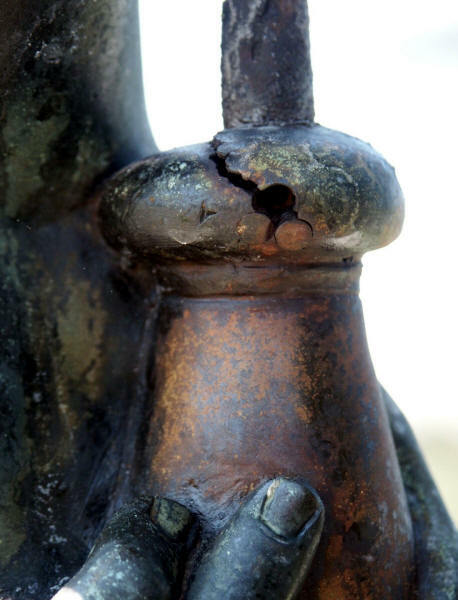 Compressive stresses do not cause cracking. In fact, shot peening is often used to reduce the susceptibility of metallic materials to fatigue, SCC, and other forms of cracking. However, a combination of tensile stresses and a specific corrosive environment is one of the most important causes of sudden cracking-type failures of metal structures. Stress corrosion cracking (SCC) and other types of environmental cracking are also the most insidious forms of corrosion because environmental cracks are microscopic in their early stages of development. In many cases, they are not evident on the exposed surface by normal visual examination, and can be detected only by special techniques. Optical or scanning electron microscopy (SEM) of failed sections may be required to fully identify them. As the cracking penetrates farther into the material, it eventually reduces the effective supporting cross section to the point where the structure fails by overload or, in the case of vessels and piping, escape (seepage) of the contained liquid or gas occurs. Cracking usually is designated as either intergranular (intercrystalline) or transgranular (transcrystalline). Occasionally, both types of cracking are observed in a failure. Intergranular cracks follow the grain boundaries in the metal. Transgranular cracks cross the grains without regard for the grain boundaries. The morphology of the cracks may change with the same material in different environments. Failures generally do not result from the ordinarily applied engineering loads or stresses. Engineering loads, however, are often additive to the residual stresses already present in the structure. These residual stresses result from fabricating processes (e.g. deep drawing, punching, rolling of tubes into tubesheets, mismatch in riveting, spinning, welding, etc.). Residual stresses will remain in a structure unless it is annealed or otherwise thermally stress relieved following fabrication, a practice that becomes increasingly impractical as a system gets larger or more complex. Cooling from the high temperatures required may also induce internal stresses because of nonuniform cooling. In fact, very slow, controlled cooling is a prerequisite for effective stress relief. Corrosion products from general corrosion or other forms of corrosion may build up between mating surfaces and, because they occupy so much more volume than the metal from which they are produced, generate sufficient stresses to cause SCC. In the example shown in the following Figure, moisture working down the steel rod in combination with the galvanic corrosion due to the contact with the bronze support caused enough rust build-up to generate high stresses and induce SCC.